Published in 1923, Toward an Architecture had an immediate impact on architects throughout Europe and remains a foundational text for students and professionals. 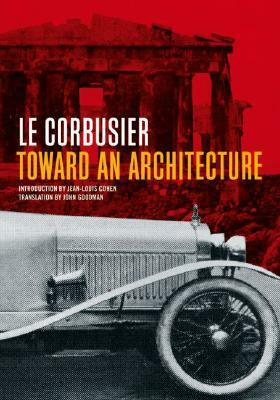 Le Corbusier urges readers to cease thinking of architecture as a matter of historical styles and instead open their eyes to the modern world. Simultaneously a historian, critic, and prophet, he provocatively juxtaposes views of classical Greece and Renaissance Rome with images of airplanes, cars, and ocean liners. Le Corbusier’s slogans—such as “the house is a machine for living in”—and philosophy changed how his contemporaries saw the relationship between architecture, technology, and history. This edition includes a new translation of the original text, a scholarly introduction, and background notes that illuminate the text and illustrations. Jean-Louis Cohen is the Sheldon H. Solow Chair in the History of Architecture at New York University's Institute of Fine Arts. He has written extensively on Le Corbusier's work. John Goodman is a translator and art historian. He has rendered some thirty books from French into English.